As always, he owns these looks in a way that only he can. I agree they are unconventional and will not align with the prevalent public aesthetic. But with his panache, they work rather well. Doesn’t the vogue spread deserve a post? Yes! This cover wants me to buy a copy of Vogue India probably for the first time ;) I like how it gently pushes the boundaries. Ranveer Singh carries it with attitude and grace. Apart from that floral look rest is bad. That banana jacket could have been salvageable if not for the stupid glares!! I actually love the covers. Don’t always agree with his clothing choices but this is where one of your fave lines would’ve come in handy — guess which one?! too in your face all the time. I do like Ranveer Singh but Vogue India as a magazine has lost its aesthetic. They should take a leaf (or page) out of their Italian counterparts. Putting a man in a skirt is not doing anything. And Anaita isn’t a flag bearer of Fashion let’s be honest, she’s there to please her B’wood frenz. Coming back to the look in question, he looks like Ranjit from the yesteryear Hindi movies. So if that’s the look he was going for – nailed it! I can’t imagine Ranveer do normal, if he ever wishes to in future and I think it’s ok.. he’s the male gaga for you! Imagine this on some other actor and it will be all out funny ?.. I support his personality. When he does normal you don’t post his pics. No post on Hindustan Times Leadership Summit where Deepika wore a saree and Ranveer a regular suit ? Exactly! Never a post on his ‘regular’ suits, in which he looks spectacular. Only and always post son his most outrageous looks, which he completely owns and looks as amazing in too. Totally agree. When he wear normal clothes pnp never features him. The only normal look of his that was posted from this is his looks from Sonam’s wedding. Both DP and RS looked great in their Hindustan Times summit looks but Pnp skipped them. The looks are posted on their stylists as well on viral’s instagram pages. Even HQ getty images are out. Hindustan Times posted them. 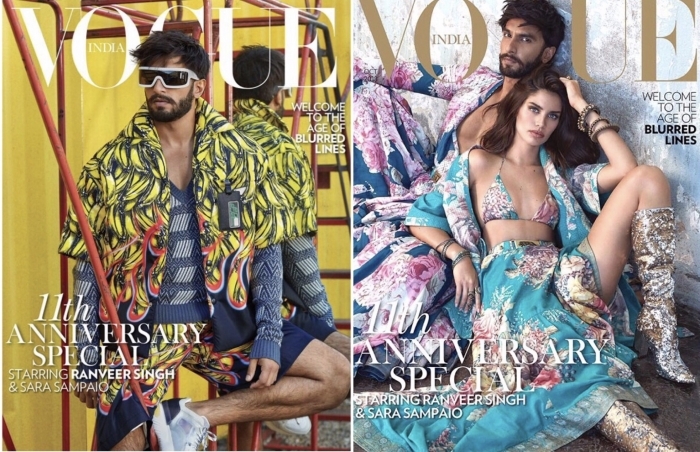 That second Vogue cover….looks like he has wrapped himself in a Garden Vareli saree. Same person, different contexts. The Vogue photoshoot is a classic editorial, perfect amounts of charm and risk. The print on the shirt in the interview is hideous, unless the goal was to be tongue-in-cheek 80s. Every 40+ nuveau riche man in Delhi looks like this (his KWK look). As for the Vogue covers, if there was anybody from Hindi films who could pull it off, it had to be Ranveer. I loved them. Ranveer is a true entertainer and his personality shines through what he wears and oh how he shines. Haters got to get PPE glasses. Love his personality and his flamboyance. He is amazing in whatever he does. He owns every look whether Suave ( HT summit) or these looks. His confidence and personality is such that he can carry anything. Be this way always. This page is awfully biased towards Deepika and Ranveer. Come back to basic … u have experienced a lot it’s time to move forward !! Words that come to mind Eyesore, Joker, Fashion Victim and last PR victim if your personal life is not enough to make you a headliner go for the in your face approach.